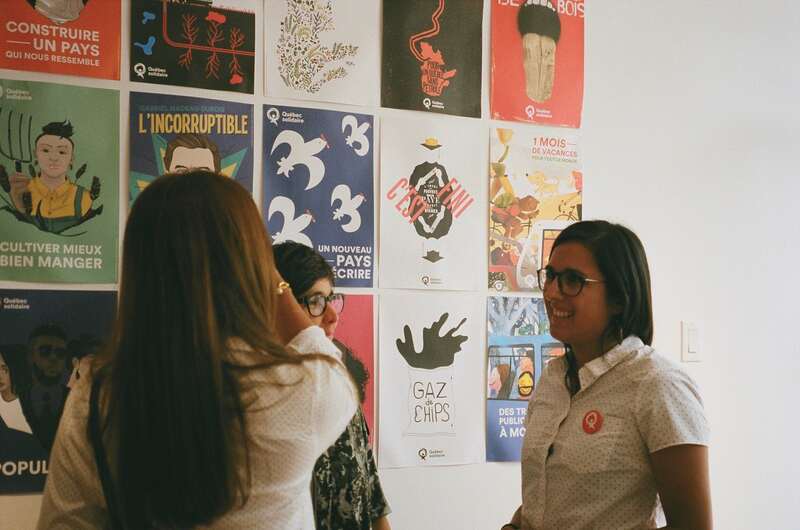 Québec Solidaire posters on the wall of Zaga Mendez's campaign office. August’s oppressive humidity hung in the air. As I got off the bus at the intersection of Sauvé and Boulevard Saint-Michel, the thick air clung to my skin and seeped into my lungs. Northward, the sky was grey. Southward, it was still clear and blue. Thunder echoed off of the concrete six-lane street, as did the neighbouring children’s half-scared, half-excited yells in response who to each celestial bellow. I was a block and a half from Alejandra Zaga Mendez’s campaign office when it started to pour. Sheets of rain broke the air’s humid seal. I ran to the office, but I still arrived soaked. Alejandra and a member of her team, Ricardo, were trying to figure out if the power had gone out. It had. Alejandra and I sat down by the window in the dark office as the rain came splashing down onto the street. Alejandra Zaga Mendez is a Québec Solidaire candidate for the riding of Bourassa-Sauvé, situated in Montréal-Nord. Montréal-Nord is situated at the Northern edge of the Island of Montreal. It is an immigrant-heavy borough; 42 per cent of residents were born somewhere other than Canada and 14 per cent of residents do not have Canadian citizenship. 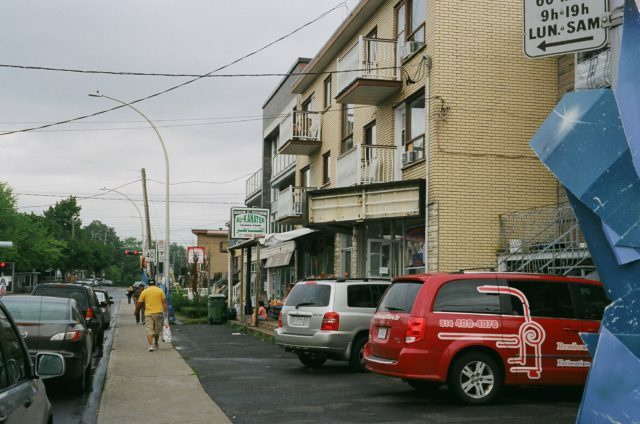 The borough is also one of the poorest parts of Montreal; 42 per cent of people earn less than $20,000 per year and low income households comprise 21.7 per cent of all households in the borough. Alejandra grew up in the riding, just a bit further east than the campaign office. In our interview, Alejandra told me that she has been politically active since a young age. In August 2008, she was galvanized by the death of Fredy Villanueva. Villanueva was an 18-year-old Honduran immigrant who was killed by SVMP officers in Montréal-Nord’s Henri-Bourassa park (now known to locals as Fredy Villanueva park). Alejandra said that she and many other residents of Montréal-Nord felt connected to Villanueva’s death: “we felt that he could have been one of us, growing up here, coming from an immigrant background.” Villanueva’s death sparked protests in Montréal-Nord, and led to the birth of Montréal-Nord Républik and Hoodstock. Montréal-Nord Républik is a community organization that describes itself as “a popular movement born in the crossfires of revolt in Montréal-Nord in August 2008;” Hoodstock is a yearly conference run by Montréal-Nord Républik held on the anniversary of Fredy Villanueva’s death. Alejandra was involved with both. Alejandra was also at McGill for the student protests of 2012, which opposed tuition hikes for Quebec students. Her and a few other students organized protests on MacDonald campus. To her, a major challenge during the protest movement was articulating what it meant to be a Quebec student to those who came from outside of the province. To Alejandra, being a Quebec student is not defined by not having a CSQ;* it’s defined by living and studying in the province. Alejandra argues that “international” students should be concerned with in local issues because they live and study at partially publicly-funded institution. Alejandra emphasized the importance of solidarity: “it wouldn’t advantage [international students] personally,” she said, but out-of-province students could have, and were allies to the protest movement during the spring of 2012. “There was a lot of explaining to do,” but Alejandra argues that the protests brought out-of-province students into contact with local movements. After her completing her undergraduate degree, Alejandra did a Master’s of Science in Renewable Resources at McGill. She also attended the Rio de Janeiro Earth Summit in 2012 and the United Nations Climate Change Conference in Lima in 2014. As she spoke with groups from across South America about poverty and ecological justice, she was reminded of the poverty she saw in Montréal-Nord. While acknowledging the different degree of poverty in Quebec and in Brazil, she noticed a pattern: both in Rio and in Montreal, those living in poor communities have little access to opportunities beyond the neighbourhood where they are born. Seeing how environmental policies directly exacerbate inequality in South America, it became clear to Alejandra that those who have the fewest opportunities are paying the highest price for a global lack of consideration for the environment. Nevertheless, she said it was inspiring to see Indigenous communities from Peru, Ecuador, and Chile articulate environmental issues not only as priorities, but as their rights. She recalled the words of an Indigenous elder from the conference in Lima: “we cannot negotiate life.” To her, this statement crystallized the ways in which the Global North, and the governing classes in the Global North, are exporting the impacts of their negligent environmental policies. Today, Alejandra is a key member of Québec Solidaire. She is running to be the Member of National Assembly (MNA) for Bourassa-Sauvé. Despite the fact that she’s running as a candidate, Alejandra acknowledges that there is validity in certain forms of cynicism. “Over and over again,” she says, “we have given power to the same elites who are not working for us.” But, Alejandra found like-minded people in Québec Solidaire: people who had backgrounds in community organizing, people had worked from the ground up. As an example of Québec Solidaire listening to the grassroots, she cited her experience drafting policy for the party’s $15 per hour campaign promise. She, Manon Massé, and others, first met with activists lobbying for an increase in the province’s minimum wage, namely non-unionized workers and workers without status. Then, they met with unions and other proponents. After receiving the input of various proponents, Québec Solidaire drafted their bill. To Alejandra, this approach is important on two fronts. First, the party must respond to and reflect the wishes of activists and community organizers as informal representatives of their respective communities. Second, the party must also be held accountable by independent grassroots movements. While the party ought to draw inspiration from grassroots movements, Alejandra believes that it should not co-opt them; “we need people on the ground fighting for each issue so that we have a balance between the government and independent social movements,” she said. Working at the provincial level is important to Alejandra because of its legislative jurisdiction. “All of my political involvement has been with provincial issues: economic justice, health, education, even the environment. They’re all under provincial jurisdiction.” Provincial-level politics are also important to Alejandra in terms of the project for sovereignty. Interestingly — to my anglophone ears, at least — she argued for sovereignty from a decolonial and ecological perspective. Alejandra finds it unacceptable that Canada continues to exist as a settler-colonial state. Sovereignty would force negotiations between the Quebec state and Indigenous people, on whose land we reside. While many see this as an insurmountable barrier to the project for independence, Alejandra has faith in cooperation between the Quebec state and Indigenous keepers of the land, citing Assembly of First Nations Quebec-Labrador leader Ghislain Picard’s positive response to meetings with Manon Massé. When I pressed Alejandra on how to disentangle ethno-nationalism from the separatist movement, Alejandra made it clear that if Québec Solidaire were interested in an ethno-nationalist conception of sovereignty, she would not be a part of the party. However, her answer focused on the positive, and perhaps theoretical, aspects of such a campaign, rather than on how to avoid entanglement with ethno-nationalist rhetoric. To Alejandra, the nationalist sovereignty views Quebec’s independence as an end in itself, whereas independence to Québec Solidaire is a means to a more progressive and empowered Quebec. She went on to discuss the process through which a referendum would happen under Québec Solidaire. The party would instate a constituents assembly, a body of elected non-partisan representatives from across the province, to draft a constitution. Then, the Quebec public would vote on a sovereign state as outlined by the constitution. This clear and democratic process, to Alejandra, is the key to building a progressive Québecois state. The Québec Solidaire policies that are most important to Alejandra are those she sees impacting her community most directly: $15 per hour minimum wage, health care, and education. In Montréal-Nord, where over four in ten residents earn less than $20,000, the impacts of a raise in the minimum wage are clear: people will have more money to spend on things like rent, groceries, and school supplies. Furthermore, Alejandra argues that raising the minimum wage will boost the local economy. Merchants and local entrepreneurs want to open business in the area, but, Alejandra argues, “there is insufficient demand because people don’t have enough money. People are choosing between buying their groceries locally or at Costco.” To that end, Alejandra suggests that “raising the minimum wage up to $15 per hour will cause people to distribute their money locally,” which, in turn, helps lead to local job creation. In terms of health, Alejandra says that the need for universal dental care is clear. “People on the street tell us — show us — that they don’t have teeth because they don’t have the money to pay for one dentist appointment per year.” Alejandra argues that lack of access to dental health replicates social inequality, so providing universal dental care is a key facet of alleviating inequality. The third central policy priority of Alejandra’s campaign in Bourassa-Sauvé is public transportation. As STM passes can be a significant expense for low-income residents of the constituency, Alejandra sees an importance in halving public transportation fees, in accordance with Québec Solidaire’s campaign promise. But, she also sees the importance in increasing funding for public transportation, especially in order to improve access to areas like Montréal-Nord. “We’re really far from downtown,” Alejandra said. For reference, it took me nearly an hour to get to the campaign office — on the Western edge of the riding — from Mont-Royal metro station. “If you don’t have a car and you have a job downtown, you don’t have a good way to get downtown,” she continued. Like Québec Solidaire, Alejandra links higher access to public transportation with a decrease in the usage of cars. To her, therefore, investing in public transportation is important for the mobility of people in her community and for the environment. Finally, Alejandra emphasizes Québec Solidaire’s policies on education when talking to people in her riding. The party proposes free education, as they put it, from CPE* to PhD. “You see so many families with three kids who don’t have the $21 per day [to send their kids to CPEs].” To her, this too is a matter of poverty reduction. And, while she had access to scholarships, she discussed the importance of making university more accessible. Alejandra supports Québec Solidaire’s vision for the future of Québec. She supports the party’s plan for a drastic economic transition, which would reorient the economy around better environmental practices. To her, the government ought not be subservient to corporate interests, nor should it exclusively focus on balancing budgets and minimizing debt. Alejandra argues that after fifty years of governments that passively respond to crisis, Québec needs a government that is proactive ─ a government that engages in ‘nation-building’ projects, such as HydroQuébec or the CEGEP system. 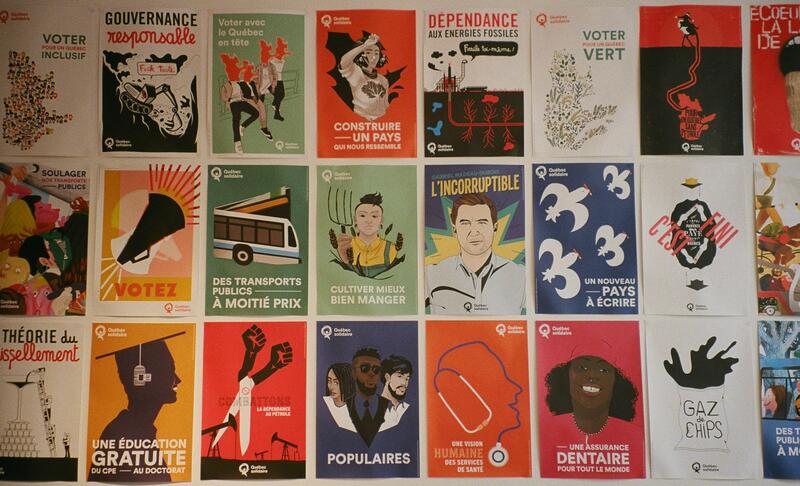 With its economic and environmental transition plan, its policies about universal education and dental care, and with its emphasis on expanding public transport infrastructure, Québec Solidaire is reviving this approach to governance in Quebec politics. While Québec Solidaire only had three members in the National Assembly (MNA), Alejandra says the party is growing. She’s right; Québec Solidaire is rising in the polls, having reached an all-time high of 14.6%. Relative to the number of MNAs, Québec Solidaire has a disproportionate amount of members: 20,000, while the governing party, the Liberal Party of Québec, have 30,000. The party is set to retain their seats in Montreal, gain a few more on the island, and potentially expand to the riding of Taschereau in Québec city. At the very least, their campaign has made them far more visible than in previous years. Alejandra says that it’s up to “the people to decide,” but she suggested that Québec Solidaire does not have anywhere to go but up. While, inevitably, the Liberals, the Coalition Avenir Québec, or even the PQ will form government after October 1st, Québec Solidaire is building an alternative movement and is keeping leftist principles alive in the political sphere. To paraphrase the speech Amir Khadir gave at Alejandra’s campaign launch in early September, winning elections is about hard work and defying odds. But, even in the ridings that aren’t won, the groundwork for the next election, or the following, is being built. It was no longer raining when I left the interview, but the power was still out. I stopped in a grocery store on the corner of Fleury and Boulevard Saint-Michel. People were walking around, using their phones as flashlights. It felt childishly fun to be pulled out of the ordinary — to be exploring a grocery store as though it were the site of a scavenger hunt. I walked down Saint-Michel and waited for the bus. I watched kids play on a balcony above a strip mall. The bus didn’t come for some time. I was in no rush; it was summer, and soon I would be back in the Plateau, where I would have plenty of metro stations and frequent bus lines, and where I would be close enough to bike to most places I venture to in under thirty minutes. Others there, however, were getting increasingly impatient — pacing, tapping their feet, scrolling indefinitely on their phones. When the bus came, there were three in a row. We shuffled on and were shuttled to the metro. I re-emerged, out from the underground, at Mont-Royal. The sky was clear. It felt like it hadn’t even rained.